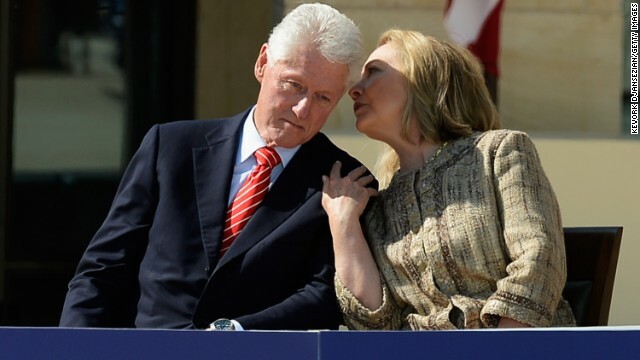 Washington (CNN) – As former Secretary of State Hillary Clinton embarks on her new career as a paid speaker, she joins a lucrative family business that already has earned her husband more than $100 million since leaving office in 2001. And despite the sluggish economy, business is booming. According to a CNN analysis of 12 years of federal financial records, former President Bill Clinton had his most active and profitable year on the lecture circuit in 2012, delivering 73 speeches for $17 million from mid-January 2012 through mid-January 2013. That brought his total haul in speaking fees since leaving the White House to $106 million. His previous record for annual speech income was $13.4 million in 2011. President Clinton's speaking fees were detailed Wednesday in a financial disclosure report that his wife was required to file after resigning as secretary of state. Secretary Clinton, who stepped down in February, is also expected to be in high demand as a paid speaker. She delivered her first paid remarks last month in Dallas to the National Multi Housing Council and has at least eight additional events scheduled in 2013. "There are a whole lot of motivational speakers, pundits, journalists, athletes, and film-makers giving speeches, but not a lot of former presidents and former secretaries of state who were also first lady," said Amy Walter, national editor of the Cook Political Report. "It's hard to get much higher in the pantheon than that." Both Secretary Clinton's personal office and The Harry Walker Agency, which represents the Clintons on the speaking circuit, declined to comment on how much she would earn per speech. Politico reported in February that the former first lady would earn "well into the six figures." That would likely put her at a similar tier as her husband, who records show has averaged $195,000 per speech, ranging from as little as $28,000 for one event to $750,000 for another. Secretary Clinton's upcoming schedule provides at least one additional clue as to how much she could earn per event. In August, she will give the keynote address to the Global Business Travel Association's annual convention in San Diego. A GBTA spokeswoman declined to comment on the former secretary's speaking fee, but federal records show the group paid President Clinton $250,000 to keynote its 2012 convention in Boston. Former President George W. Bush also spoke at the 2012 event, but his speaking fees are not available to the public. While it is not unusual for former presidents to earn millions of dollars in speaking fees after leaving office, President Clinton has been the only one subjected to strict disclosure requirements as a result of his wife's position as a high-ranking federal official, first as a U.S. senator and then as the nation's top diplomat. Now that both Clintons are private citizens, their speech income for 2013 and onward will not be available to the public unless one of them rejoins the federal government or runs for federal office. As in previous years, the former president's highest-paying events were held overseas. He earned $5.2 million last year for 15 speeches given in 12 countries. The most lucrative was a February speech to a local newspaper publishing company in Lagos, Nigeria, for which he received $700,000. He addressed the same group in 2011 for the same amount. He earned an additional $150,000 for a June speech delivered via satellite to an audience in Australia, while on a speaking tour in Florida. The remainder of his 2012 speech income was earned before domestic audiences in 15 states and the District of Columbia. In 12 years as a private citizen, Clinton has delivered 544 paid speeches and earned an average of $195,000 per event. He has visited 27 states, as well as the District of Columbia and Puerto Rico. His popularity on the international lecture circuit has taken him to 54 countries, where he has earned a combined $57 million, more than half of his total speech earnings. Secretary Clinton traveled nearly one million miles and visited 112 countries as the nation's top diplomat, which likely makes the Clintons among the most well-traveled couples in the world. The former president's most popular destination outside of the United States has been Canada, where he has participated in 58 paid events for a total of $9.9 million, followed by the United Kingdom, where he earned $3.2 million for 16 events, and Mexico, where he delivered 15 speeches for $3.3 million. In 2012, he gave his first paid speeches in Costa Rica and the Czech Republic. Within the United States, Clinton has spoken at 76 paid events in New York, 49 in California, 37 in Florida and 23 in Las Vegas, Nevada. Clinton's annual earnings from speeches have varied from year to year depending on his schedule and availability. His 72 paid speaking events last year almost tripled the 25 paid speeches he gave four years earlier in 2008, when he spent much of the year campaigning for his wife's unsuccessful presidential bid. He gave only six paid speeches for $875,000 in 2004, when he spent much of the year writing his memoirs and recovering from heart bypass surgery. The former president was an elected official on a fixed government salary for all but two years from 1977, when he took office as the Arkansas attorney general, until leaving the White House in January 2001. While he worked in state government, his wife, then an attorney, was the family's primary bread-winner. They swapped roles in 2001 as the president became a paid speaker and as the first lady took her seat in the U.S. Senate. When President Barack Obama first nominated then-Sen. Hillary Clinton to his cabinet in December 2008, the former president agreed to a number of steps to guard against possible conflicts of interest that might arise from his various post-presidential activities. In particular, he agreed to allow State Department and White House ethics officials to review his slate of proposed speaking engagements. Now, with Secretary Clinton in private life, there will be heightened scrutiny on her speaking engagements, especially as she mulls a possible 2016 presidential bid. "Bill Clinton is obviously very careful in the type of speeches he chooses and the groups he chooses to speak to, but he doesn't have to be as careful as Hillary now does," said Walter. "If she chooses to speak to a group or in a part of the world that's controversial, that's going to be something she's going to have to defend." Her upcoming events include: the INSITE financial conference in Hollywood, Florida, on June 5; the Society for Human Resource Management's annual conference in Chicago on June 16; a meeting of the Economic Club of Grand Rapids on June 17; the Unique Lives & Experience women's conference in Toronto on June 20; the Global Business Travel Association convention in San Diego on August 7; the American Society for Clinical Pathology annual meeting in Chicago on September 18; the American Society of Travel Agents convention in Miami on September 19; and the REALTORS annual conference in San Francisco on November 9. Secretary Clinton discussed her speaking plans and addressed 2016 rumors in a January interview with CNN's Jill Dougherty and Elise Labott. "I have absolutely no plans to run.... I am out of politics right now," she said. "And I don't know everything I'll be doing. I'll be working on behalf of women and girls. I'll be hopefully writing and speaking. Those are the things I'm planning to do right now." President Clinton's office declined to comment for this article. show me the money...but along way from al gore millions.. They both have served the country well. Wow... he made LOTS more than Romney. Where's the tax returns, Bubba? power and money people.... it is all about the power and money no matter how much they claim they are looking out for you, the little guy. the clinton's are a farce. wake up america. Next time he runs for public office, he'll be more than happy to show them to you. Until then it's none of "you people's" business. I said no thank support vote for hillary clinton 2016. She is lied her story what happened about benghazi of murder 4 amercian so we are shamed to bill clinton was affair with other lenzisky. What does he speak about? What the meaning of is is? The finer points of enjoying good cigar or how to succeed in conning the public for fun and profit? There is money to be made if there is a market for for the product. As for making more money than Romney...who knows for sure especially when Romney hides his money in tax haven off shore accounts. Hillary's first speech should be in front of the families of all of the people that were killed or injured in Benghazi. Might I suggest a title for it? "Why I Lied to You about the Video and Never Sent Help"
Hmmmmm... OK. We'll wait to see them when Hillary runs, since no doubt they file jointly. What does he speak about? What the meaning of is is? Well, whatever it is he speaks about, there can be no doubt he is being well paid for his words. Every speech she gives should be greated with chants of "Benghazi, Benghazi, Benghazi, Benghazi". It is the least we can do for those 4 dead Americans until she tells the American people the truth. who would you rather listen to mitt or bill ? Bill is a great speaker. so is Hillary .Both should do fine. There is money to be made if there is a market for for the product. lies are a product? who knew?! Anthony Weiner As an NYC mayorial candidate! Disgusting! worked! On Nov 6. Not Now! "power and money people.... it is all about the power and money no matter how much they claim they are looking out for you, the little guy. the clinton's are a farce. wake up america." Do you even have the slightest clue what CGI and how many millions of people it has helped? You're just spitting and sputtering and raging for no reason. Of course Bubba is getting gravy for speaking fees...but his organization is doing good work around the world and I can guarantee that's part of why he gets paid so much to show up and speak to people. cgi = clinton global initiative so is there no work to be done right here in the good old usa??? let's take care of our own before we start taking care of the rest of the world. are they helping with the oklahoma tonado victims? or sandy victims?? how about some clinton usa initiative?